I often hear the terms “at-will” and “right to work” used interchangeably and/or incorrectly. The most common misuse: “This is a right to work state, so I can fire an employee any time!” Not so fast. This article discusses what these common employment terms really mean. Equally important, it provides businesses with a user friendly guide to when they may — and may not — terminate employees. This provision, effective since 1946, prohibits unions from requiring employers to hire only union employees. An Arizona statute restates this language verbatim. Thus, “right to work” is a term that has little or nothing to do with “at-will” employment (described below). It is a term that deals strictly with unions — restricting their ability to force employees to join and pay union dues. Right to work laws are rarely invoked these days — particularly in Arizona, which has a relatively low union presence. “At-will” employment means that the employee may be terminated from employment at any time for any lawful reason or for no reason. Similarly, at-will employees may resign at any time for any or no reason. The termination was in retaliation for the employee’s reasonable disclosure of the employer’s violation of state law. A retaliation claim requires (1) a reasonable disclosure of information, (2) that the disclosure be made to a supervisor with authority to investigate or the employee of a state entity, (3) that the employee believes that the employer is violating or will violate the Arizona constitution or Arizona statutes, (4) that the employee’s belief is reasonable, and (5) that the employer “terminated the employment relationship” because of the disclosure. Might the employee have damaging information regarding the company’s affairs, including knowledge of illegal, unethical, or otherwise improper conduct by ownership or management? What is the employee’s documented past work record? If it is good — no written discipline coupled with raises and/or favorable reviews and comments — then the termination may be deemed pretextual. Is there any record of the employee complaining or uncovering improper conduct by the company? If so, the risk of a pretext finding rises dramatically. What are the chances the now ex-employee will bring a lawsuit against the company? What sort of claims can be brought and what is the company’s potential exposure? How will the ex-employee appear before a jury? Does he or she have an exemplary past? How will your own employees and ex-employees appear? Do they uniformly support your position or will some provide evidence against you? What will it cost in dollars, time, and bad publicity to defend a lawsuit? Can there be collateral damage (lost sales, contracts, or clients; government investigations; penalties, etc.)? Failing to identify and correctly answer these questions can result in massive pain. The “at-will” doctrine affords employers with a great deal of autonomy in making employment decisions. However, there are limits to an employer’s power — limits that are well-defined in state and federal laws. Businesses should at least know of the existence of laws that can be applied against them; then, they will be able to make informed, logical, and defensible employee decisions (please see The Dark Side of Employee Discipline for a discussion of common employer mistakes). Management training is critical when it comes to knowing the law. Ensure that your managers are trained by legal counsel on an annual basis. This preventive maintenance will enable management to (1) know current laws and (2) spot potential issues as they arise. No one wants to learn the law only as the result of an EEOC charge or whistleblower lawsuit. A significant portion of the Bourque Law Firm’s practice is devoted to litigating business disputes, including shareholder and contract disputes. This edition of the HR Law Insider discusses the all too frequent situation where owners of a business clash and a decision is made to terminate a co-owner’s employment. 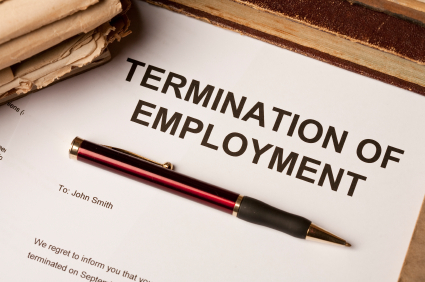 One of the toughest decisions a business owner can make is to terminate a co-owner’s employment. Making such a decision will not only end someone’s job, it will likely fracture or destroy a relationship. Given the rights afforded to minority business owners, the decision to relieve a co-owner of his or her job should be carefully thought out. Absent an agreement providing for a definite term of employment or mandating termination only for cause, employment in Arizona is terminable at-will. (a) The employer has terminated the employment relationship of an employee in breach of an employment contract. (b) The employer has terminated the employment relationship of an employee in violation of an Arizona statute. The refusal by the employee to commit an act or omission that would violate the Constitution of Arizona or its statutes. The disclosure by the employee in a reasonable manner that the employee has information or a reasonable belief that the employer, or an employee of the employer, has violated, is violating or will violate the Constitution of Arizona or an Arizona statute to either the employer or a representative of the employer who the employee reasonably believes is in a managerial or supervisory position and has the authority to investigate the information provided by the employee and to take action to prevent further violations of the Constitution of Arizona or an Arizona statute. Thus, employees in Arizona have very limited rights to bring wrongful discharge claims (in addition to any potential claims under federal law). DOES THE AT-WILL DOCTRINE APPLY TO CO-OWNERS? The at-will doctrine does indeed apply to co-owners of a business. Absent an agreement that entitles a minority co-owner to continued employment, the co-owner’s employment is terminable at-will. * Is there a potential agreement which gives the co-owner employment rights, such as an employment agreement, a shareholder’s agreement, a buy-sell agreement, or company bylaws? * Would termination potentially violate any Arizona statute? * Would termination potentially violate any federal statute? * Would termination arguably be in retaliation for the employee’s protected conduct? * What corporate formalities, if any, need to be followed? In the “typical” employee discharge situation, the relationship ends and the parties go their separate ways. This is not the case when the parties remain co-owners — still attached at the proverbial hip. Terminated co-owners are often very unhappy. When terminating a co-owner’s employment, assume that the fired co-owner will vigorously and aggressively exercise his or her rights. It is therefore critical to treat co-owners fairly, comply with all agreements, and to follow corporate formalities. In short, be prepared beforehand. Arizona has a number of statutes that protect corporate shareholders and members of limited liability companies. Visit http://corporatelawinsider.com/ for one such example: corporate shareholders — whether employees or not — are entitled to obtain substantial documents and information about the corporation’s financial and business affairs.